By opening a Doggiebox drum kit (.dbkit file) directly, you can dig into its contents in order to add or remove instruments, or adjust the properties of those it contains. You can also create a new kit by choosing New Drum Kit from the File menu. The drum kit document window is divided into three main areas, as shown in the following screen shot. The main parts of the drum kit document window. At the top of the window is a text field specifying the drum kit's name (which will be shown in the drum kit palette, for example). Beneath the kit name is a text area in which to enter a general description of the drum kit. This is also a good place to include any copyright and licensing information. The two buttons next to Linked sound files are described later in this section. The instrument browser, in the middle of the window, displays a hierarchal menu of all the groups, instruments and variants that are defined within the drum kit. As discussed earlier, Doggiebox allows you to group together drums or instruments of a related nature (e.g., all crash cymbals). Each group contains one or more instruments (e.g., a thin crash and a dark crash), and each instrument comprises one or more specific variants (e.g., a stick hit, mallet hit, or bell tap). Drums in each group are also organized together in the drum kit palette. An instrument's variants are accessible via its pop-up menu. Groups are shown in the first column of the browser. When editing a song, the number of rows shown in the pattern editor corresponds to the number of drum groups that are defined here. Instruments belonging to the currently-selected gorup are shown in the second column of the browser. Variants for the currently-selected instrument are shown in the third column of the browser. Each instrument may have more than one variant. Selecting a variant will reveal its attributes in the lower section of the window. To add or remove a group, instrument or variant, click or above the appropriate column. Double-click on an item to rename it. To re-arrange items within a column, simply drag and drop them with the mouse. 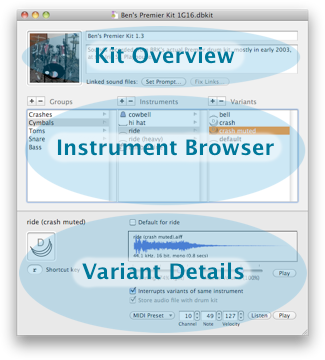 With one or more items selected (instruments, variants, or even entire groups), you can Copy and Paste, as well as drag and drop either within the browser or amongst drum kits. Contextual menus are also available on many items throughout the drum kit document by right-clicking.